Trey calls this unique, Case-Colored custom the “Patriot Elite”. The slide is hand polished and then sent to Doug Turnbull for his exceptional bluing and color case hardened finish on the frame. The frontstrap was left bare to show off case colors. Another interesting gun is this 4″ Commander-style 1911 K-5 with beautiful, fan-pattern Cocobolo grips. Notice that the muzzle is flush crowned. A new option for Wilson, the flush crown is made possible by the use of a flat wire, Glock-style recoil spring. This new feature is only available for compact/professional length slides at this time. The Wilson Arms Blog also links to a Military Times long-term test of the Wilson Tactical Trigger Unit (TTU) for AR-type lowers. The Times tested the TTU over six months with 10,000 drops of the hammer. Click Here to read the full review, published on Sept. 29, 2010. Share the post "Wilson Combat Publishes New Gun Blog"
A while back, Forum member Andy (aka GrayMist) did an interesting test, with five (5) different types of .243 Winchester Brass. He collected Federal, Lapua, Remington, and two different lots of Winchester-brand brass. Then he selected ten (10) cases at random from each brand and measured their weights. To ascertain case capacity, three (3) cases from each brand/lot that were closest to the average weight for that brand/lot were selected. The results were surprising: there was less than one (1) grain capacity difference between all the cases, even with a 14.7 grain maximum difference in case weight! The cases were sized in a Redding body die then primed with a spent primer. All were weighed before and after filling them with distilled water. The capacity shown is an average of all three (3) cases from that lot and represents grains of water. Note, I tested two lots of Winchester brass. Lot A was purchased in 1999. Lot B was from factory .243 ammo. There is a rather large disparity in case weight between the two lots. 1) Standard Deviation in grains. 2) Range is the difference in weight between the heaviest and lightest cases in the test. 3) Case range weight divided by the average weight. Andy observes: “It certainly seems there is a huge difference in case weight between Winchester lot A and any other brand of 243 tested. What is also surprising is that there was less than one (1) grain capacity difference between all the cases, even with a 14.7 grain difference in case weight! In a previous session Andy weighed all 100 Lapua cases he had on hand. His measurements showed a total variation of 2.1 grains, with the weight range being 172.5 to 174.6 grains. That is a 1.2 percent spread. The most that came in at the same weight were 11 cases at 173.5 grains. Share the post ".243 Win Brass Comparison Test — Surprising Results"
Just a few days after his win at the 3-Gun Nation Championship (earning him a $25,000 prize), SGT Dan Horner of the USAMU won another 3-Gun event, the Adams Arms Ozark 3-Gun Championship in Missouri. There was plenty of excitement at the final shoot-off on Sunday afternoon. Eight top shooters competed in the shoot-off, with a $5,000 check on the line. The first two competitors to face-off were famed 3-gunner Taran Bulter and SGT Dan Horner, still fresh off his big win at the 3-Gun Nation Championship. Known for his speed, Horner had the advantage out of the gate and knocked Butler out of the running. The next pairing was seasoned shooter Kurt Miller and newcomer Bryan Ray. While Miller has been a strong presence in the world of iron sights for years, Ray recently broke onto the scene, capturing first place in the Heavy Metal class for his first win at a national-level competition. In the end, Ray was able to beat Miller after an incredible run and advanced to the semi-finals. Up next were Clint Upchurch and Rob Romero of the Noveske Shooting Team, where Romero's blazing speed earned him a win into the semifinals. The final pairing was Surefire's Barry Dueck versus Chris Sechiatano, with Sechiatano edging out Dueck to secure a spot in the next bracket. Horner and Ray were next to the line in a nail-biting run. The pairing of Horner, perhaps the fastest shooter the sport of 3-gun has ever seen, against Ray, a hard-charger who seemingly rose to the leaderboard out of no where, was exciting to say the least. Although Ray had an incredible run, Horner’s speed and accuracy gave the young Staff Sergeant the upper-hand. The finals came down to Horner and Romero. Despite his best efforts, Romero couldn’t match Horner’s speed. SGT Horner walked away with another 3-Gun win under his belt and a check for $5,000 in his hand. Share the post "SGT Daniel Horner Wins Ozark 3-Gun Championship"
Werner Mehl, the engineering genius behind Kurzzeitmesstechnik (Kurzzeit), a German technology company, has come up with another spectacular ultra-slow-motion video. Werner has developed some of the most advanced video equipment in the world, allowing him to film bullets in flight with frame rates up to 1,000,000 frames per second. That’s not a misprint — some of the Kurzzeit video cameras can record at ONE MILLION frames per second, though typical Kurzzeit “high-speed” videos might be shot at 200,000 or 250,000 frames per second. 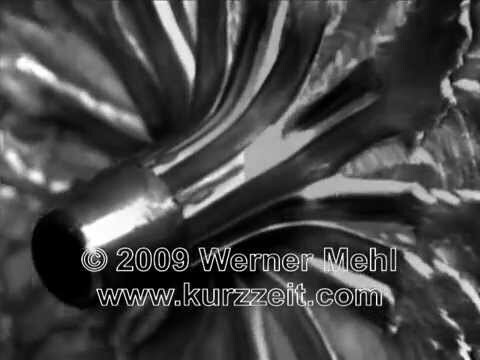 This 10-minute video was specially prepared by Werner for the 2009 SHOT Show. A masterpiece of high-speed movie-making, Werner’s video displays an amazing array of projectiles and targets. You can see bullets hitting armored and non-armored targets, bullets ripping through ballistic gelatin, bullets shattering glass, and even shotgun pellets striking rifle bullets in mid-air. Look for the effect of hollow points as they pass through the ballistic gelatin, and at the 4:26 mark you can see an airgun pellet slice though a paper target. In addition to producing high-speed video equipment, Kurzzeit builds the PVM-21, one of the most advanced consumer chronographs on the market. The “all-infrared, all the time” PVM-21 works in any lighting conditions, including total darkness. It employs two banks of infrared sensors (front and back — the black boxes in right photo). These are aligned vertically and placed 8″ apart (left to right.) That gives you a huge 4.5″ x 8″ sensor area to register shots. We’ve worked with some other chronographs where the practical “sweet spot” for reliable results was just 2″ x 2″, when using an air rifle. The PVM-21’s large sensor area makes it easy to align your rifle, and you don’t get errors if your shot is just a little off-center. The PVM-21 can hook up directly to a lap-top computer. That way you can record all your shot velocity data directly into a spreadsheet. The PVM 21’s large sensor area and software interface make the PVM one of this Editor’s favorite chronos, along with the classic Oehler model 35P. In the USA, the Kurzzeit PVM-21 is sold by Neconos.com. The $749.95 price includes sensor unit (with infrared), processing/display unit, infrared remote control, and software. It’s an impressive package — we just wish Werner would upgrade the display unit to include a rechargeable 12V DC battery. Right now you need to use an inline 120V AC to 12V DC transformer, or carry a separate 12V battery. I personally prefer to use a 3.5″x1.5″ rechargeable 12V battery rather than a 120v transformer and extension cords. Share the post "Another Amazing Video from Kurzzeit.com"
We’ve confirmed that Danny Biggs, the Spirit of America’s F-Open Class Winner, shot the match using a bipod, rather than a pedestal rest. This is pretty remarkable because top F-Open competitors have traditionally preferred the stability and quick adjustability you get with a deluxe pedestal rest such as a Farley, John Loh (J.J. Industries), or SEB. Of course, Danny had a trick up his sleeve — his prototype Sinclair International bipod features a quick-adjusting elevation control. No, you can’t buy a bipod like Danny’s — at least not yet. Sinclair Int’l hopes to offer production versions before the end of 2010. An interesting fact about Biggs’ win is that he was shooting off of the Sinclair F-Class Bipod which is generally used in F-TR competition. In F-Class open most competitors shoot off of a bench-type rest modified to shoot off of the ground in the prone position. The bipod Biggs [used] is a new-model Sinclair Elevation-Adjustable version of the newer Sinclair F-Class Bipod. Danny has been testing this product for us during the past year and obviously is having great results. We should have these bipods ready for production in a few months. Keep posted to our website for announcements. But trust me, I think Danny would shoot well balancing his gun on a rock –- he’s that good! While most F-Open shooters used a front pedestal rest, either a joystick design or a center column pedestal with remote-adjustable windage top, Danny used a wide-base bipod, as he had done at past Nationals in the F-TR class. But Danny’s bipod was very special. It is a prototype, modified Sinclair design with height adjustment via a central, vertical-axis knob. As you can see from the pictures below, the left and right bipod legs are attached to a T-shaped silver (aluminum) bracket. This bracket moves up and down as the silver knob is turned clockwise or counter-clockwise. As the knob turns, its threads pull the T-shaped bracket up and down relative to a center block of aluminum bolted to the bipod’s attachment to the rifle’s forearm accessory rail. With this system, Danny can easily reach forward and make precise adjustments in elevation. Note that the Sinclair bipod’s secure rail attachment is retained and Danny can still adjust rifle cant (tilt), using the rear push-button handle. This rear handle functions like a Pod-lock allowing the rifle to be tilted a few degrees to one side or the other to compensate for side-sloping terrain. Share the post "Danny Biggs Wins SOA F-Open Class Shooting from Bipod"
Many shooters expend considerable time and effort to coat their bullets with friction-reducing compounds such as Boron Nitride (HBN), Molybdenum Disulfide (Moly), and Tungsten Disulfide (WS2 or ‘Danzac’). Many of these same shooters believe that coated bullets permit longer strings of fire between barrel cleanings. Also, there is some evidence that coated bullets may extend barrel life (though this remains controversial). What if you could enjoy all the benefits of coated bullets without the effort? When you think about it, why not apply the anti-friction coating to the barrel itself, rather than the bullets? That is the thinking behind salt-bath nitriding of barrels. This nitriding process creates a very slick, very hard surface coating on the steel in the bore. The coating is only 10-20 microns thick (so it doesn’t cause pressure problems). But that coating is enough to reduce friction, and just possibly, extend useful barrel life. John Whidden, Camp Perry Long-Range National Champion in 2007, 2008, and 2010, recently had one of his Broughton 6mm match barrels nitrided by Joel Kendrick. Joel does the salt-bath nitriding for MMI TruTec. Whidden reports he “is happy as he can be with the barrel” after the nitriding process. After nitriding, the stainless Broughton 5C barrel was “every bit as accurate as before, and noticeably easier to clean”, according to John. Also, John reports that he did NOT have to change his load after the barrel was nitrided (which left it with a handsome black, semigloss finish). Whidden says, “after cleaning, the barrel takes about 3-4 rounds to settle in… that’s the same as before.” This barrel shot very well before nitriding, and after nitriding, John used it successfully at Camp Perry in the 2009 Wimbleton Cup competition. Overall, John tells us “Everything looks good. No accuracy loss, and easier cleaning.” He is pleased enough that he has sent more barrels to Joel Kendrick for nitride processing. John also said that he’s heard that nitrided barrels in some of the big caliber rifles, such as the .338 Lapua Magnum, are showing “significantly enhanced” barrel life. To learn more about salt-bath nitriding for barrels, or to place a processing order with MMI-TruTec, email joelkndrck [at] aol.com, or call Joel at (704) 616-6442. Joel, a past 600-yard Shooter of the Year, is very knowledgeable about both shooting and the nitriding process. He can give you well-informed answers to your questions. Price for nitriding depends on quantity — call Joel for pricing details. Share the post "Salt-Bath Nitriding for Barrels — Whidden is Impressed"
Here’s a product that should interest varminters and Service Rifle shooters. Mossberg has just introduced its new Tactical .22 auto-loading rimfire rifle. With a $276 MSRP, the Mossberg Tactical .22 provides the look and feel of an AR-style rifle with an affordable price. This gun, officially sold by Mossberg Int’l, promises to be a fun plinker that can also work for very close-range varmint hunting on small prey. Service Rifle shooters looking for an inexpensive trainer will find that the Mossberg Tactical .22 shares most of the ergonomics of their centerfire AR-15 match rifles. With the rising costs of centerfire ammunition, Mossberg’s new Tactical .22 rimfire can provide a cost-effective training platform. The lightweight Mossberg Tactical .22 is based on Mossberg’s proven model 702 rimfire autoloader. Mossberg adapted the Model 702 action to an AR-style chassis with an 18″ barrel and a quad-rail fore-end. (We would rather see standard AR-style handguards, but this does allow a varminter to mount lights or other accessories on the forearm.) The Mossberg Tactical .22 will be offered with two stock configurations — a fixed stock with 13″ LOP, or a 6-position stock that can adjust length of pull from 10-3/4″ – 14.5″. The adjustable stock may be good for young kids, but otherwise we recommend the fixed stock. The Tactical .22 comes with an A2-style carry handle and an adjustable rear peep/front blade iron sights. On top of the carry handle is a Picatinny rail for mounting optics. Groan — that’s the wrong position for a scope, because you can’t maintain a cheek weld, but the rail is better than nothing if you need to mount a red dot or other sighting system. A 10-rd magazine is standard. Share the post "Mossberg Introduces $276 AR-15 Clone Rimfire Trainer"
Would you like a “dream job” helping to develop new firearms for a major manufacturer with a strong heritage? Are you interested in Tactical and Law Enforcement rifles? Well here are two great opportunities. Both Smith & Wesson and FNH USA are currently seeking to hire product managers. The S&W Tactical Rifle Product Manager, based in Massachusetts, will be responsible for developing short-term tactics and long-term strategies to achieve margin and revenue objectives. This position involves strategic planning, product development and category growth. According to S&W, the successful candidate “will drive the strategic positioning of S&W within the broad tactical rifle market, identify and execute emerging user trends and growth opportunities with a very strong focus on new product development.” A bachelors degree is required, with MBA desirable. Candidates should have 7-10 years job experience with 5 years in product management leadership roles. To apply, contact Danielle Sanville, HR Dept., dsanville [at] smith-wesson.com, (413) 747-3477. FNH is seeking an Assistant Product Manager for its Law Enforcement and Commercial Sales group, based in McClean, VA. FNH says: “Candidate duties will include new product launch and enhancement development for firearms in the law enforcement and commercial markets. Experience in product or project management to include business case development and product launch planning/scheduling is required.” Knowledge of firearm design, testing, and manufacturing processes is beneficial. A bachelor’s degree in business administration or marketing is preferred. Knowledge of the general firearm market or competitive shooting sports is desired. If you’re interested, email Paula Staudt, FNH Human Resource Director, fnhusahr [at] gmail.com, or call (703) 288-3500. Share the post "Product Manager Jobs Offered by Both S&W and FNH USA"
It’s been over a year since Sebastian Reist drove out to Pennsylvania to participate in the 2009 Williamsport 1000-yard BR school. A talented professional photographer, Sebastian did a superb job capturing the highlights of his Williamsport 1K training weekend in a marvelous slideshow, complete with sound track. Photos and slideshow courtesy www.sreistphotography.com. If you haven’t viewed this video when we first ran it, you’re in for a treat. Sebastian captured some talented shooters in “mid-string” and he snapped some beautiful photos of the Williamsport facility. This is the same range where Matt Kline set a Williamsport 1000-yard world record, placing 10 shots from his 300 WSM heavy gun in just 2.815″. All shots were well-centered up for a 100-4X score. If you want to “run with the big dogs” in 1000-yard Benchrest competition, the Williamsport facility is a great place to learn. A lot has changed in the past 40 years. Compare the current deluxe covered shooting bays with Williamsport, circa 1968. Share the post "Check out the Williamsport Long-Range BR School"
If you’re located anywhere near Camp Perry, Ohio, you may want to plan a road trip on Saturday, 2 October, a week from today. On October 2nd, the CMP North Store is running a special Customer Appreciation Day and Open House. The store opens at 8:30 a.m. and closes at 4 p.m. in the afternoon. Over 400 surplus military rifles will be on display. If you don’t have an M1 Garand yet, here’s you chance to hand-pick a classic rifle for your collection. CMP Armorers will help customers inspect the rifles they have picked out and assist customers with the purchasing process. Open House visitors get free complimentary coffee and donuts in the morning and complimentary hot dogs and chips in the afternoon. In addition to food and refreshments CMP will give out free summer event T-shirts to the first 50 visitors to the store. Guests may also take home free CMP giveaways while they last, Conrad said. The CMP North store recently reopened following an inventory organization period following the 2010 National Matches. The store sells surplus M1 Garand rifles to qualified buyers along with ammunition, books, clothing, memorabilia and a limited supply of .22 caliber rifles, air rifles and accessories. For more information, call the CMP North Store at 419-635-2141 Ext. 1505. CLICK HERE for a map and directions to the CMP North store. Share the post "CMP Open House at Camp Perry Store Next Weekend"
It’s comforting to know that our U.S. Border Patrol (USBP) personnel are not only competent with firearms — some of them are among the finest shooters in the entire law enforcement community. At the recent National Police Shooting Championship held in Albuquerque, NM, USBP agents dominated the individual and team competition, outshooting LEO competitors from around the country. Senior U.S. Border Patrol Agent Robert Vadasz topped the field of over 400 competitors to secure his second National Police Shooting Individual Championship in three years. Vadasz dropped a mere 19 shots throughout the tournament, finishing with a 2981-221x score. Finishing second was Customs & Border Protection agent Doug Goff, with 2976-199x. U.S. Border Patrolman Kevin Worrell finished thrid with 2973-193x. In team competition, U.S. Border Patrol squads turned in great performances. USBP Teams finished first and second in the Open Class Revolver 4-Officer Event, with USBP Blue Team scoring 2372-163X, and USBP Gold Team finishing second with 2356-131X. In the Open Class Semi-Auto 4-Officer Team event, the USBP Blue Team scored 2357-147X to finish a close second to the winning CBP Blue Team, which took the title with a 2360-134X tally. Photos courtesy the NRA Blog. Share the post "U.S. Border Patrol Dominates Nat’l Police Shooting Championship"
We recently reported that Trudie Fay of Raton, NM, shooting on her home range, was the Fullbore winner at the Spirit of America Match. Trudie and many other shooters set new National records during the course of the match. Trudie fired an aggregate score of 1781-104x, which was an Open, Civilian, and Woman’s National Record. Second place, with a Senior National Record, was Tom Whitaker. High Grand Senior was Johnie Franklin, high Junior was Kyle Doney, high Service was Emily Windmassinger. There were also new records set in F-Class competition, in both F-Open and F-TR classes. High F-Open shooter was Danny Biggs with a score of 1777-88x. Danny’s score was an Open, Civilian and Grand Senior National Record. High Senior was Jim Murphy firing 1766-90x. Michelle Gallagher was the high F-TR shooter firing a score of 1717-62x. Michellle’s score was an Open, Civilian and Woman’s National Record. Daniel Borwiecki of the Marine Corps Rifle Team was the high Service shooter. Robert Depp was the high Senior and Alan Canavan was high Grand Senior. The winners were “chaired,” holding their rifle and hoisted in the air by the competitors. Trudie Fay, wearing white gloves, was carried in Raton’s timber sedan chair by the Fullbore competitors. Danny Biggs, the F-Class winner, was carried in a rocking chair by the F-Class competitors. Michelle Gallagher, the F-TR winner, was carried in a captain’s chair. All were carried off the 1000-yard line to the Bald Eagles Clubhouse while bagpipe music was played. Report courtesy Jan Raab and the NRA Blog. Share the post "Multiple National Records Set at 2010 Spirit of America Match"
This Sunday, September 26, Tom Gresham’s Gun Talk Radio will broadcast live from the Gun Rights Policy Conference in San Francisco, CA. Host Tom Gresham will interview speakers and attendees at the 25th Annual Gun Rights Policy Conference (GRPC), a free, 3-day conference that focuses on all facets of gun rights — past, present and future. Speakers at this year’s GRPC include Alan Gottlieb, Alan Gura, former congressman Bob Barr, Joseph Tartaro, Prof. John Lott, Massad Ayoob, Larry Pratt, Jeff Knox, and more. Also on the show this Sunday, Tom talks with Montana Senator Jon Tester about the Senator’s recent letter to Secretary Clinton and the State Department, regarding the rejection of South Korea’s proposal to sell its surplus of American-made M1 Carbines and M1 Garand rifles to the U.S. “I count myself among many gun rights advocates who fundamentally disagree with the State Department’s reasoning. Rejecting the responsible sale of legal firearms over hypothetical concerns that they could be used for “illicit purposes” sets a dangerous precedent and it is contrary to the Second Amendment rights of law-abiding Americans,” writes Senator Tester. In its 15th year of national syndication, Tom Gresham’s Gun Talk Radio airs live on Sundays from 2pm – 5pm Eastern, and runs on over 100 stations, plus SIRIUS XM Satellite Radio. All Gun Talk shows can be downloaded as podcasts through Apple iTunes, the Gun Talk iPhone App, or at Gun Talk’s Podcast Library. More information is available at www.guntalk.com. Share the post "Gun Rights and Korean Rifle Imports Discussed on Gun Talk Radio"
Stiller’s Precision Firearms has been chosen to supply the action (receiver) for the new, updated MK 13, .300 Win Magnum sniper rifle for Crane Naval Weapons Center. The contract, valued at $2,000,000, calls for Stiller’s Precision to produce long actions for the latest version of the MK 13. The Navy could not simply upgrade its M40 sniper rifles from 7.62×51 to the larger, harder-hitting .300 Win Mag cartridge, because the M40 has a short action. The new MK 13 will employ a Rem-style long action in a modified Accuracy International Chassis. Current MK 13s feature an AICS stock, and a Knights forward rail mount or a MARS rail, with a Nightforce scope. Suppressors from various manufacturers are being tested for the latest MK 13. Share the post "Stiller’s Precision Gets $2 Million to Build Navy’s MK 13 Actions"
The AccurateShooter.com Forum reached another milestone yesterday. We just passed the 12,000 mark in registered members. Not counting the Moderator, who is Member 1, our 12,000th member is “Kitch” from Florida, and we added four more members just this morning. If you haven’t visited our Forum recently, you should do so. You’ll find tons of useful information, and many of our Forum members are national-level benchrest and High Power shooters. Plus many talented gunsmiths and parts designers participate in the discussions. If you are buying or selling guns or shooting accessories, the Marketplace Area in our Forum offers FREE Classified Ads. As an example of the kind of precision rifles you’ll find in our Classifieds, below is a very nice 6mm Dasher posted for sale by Forum Member Fletcher. It has all top-flight components: Kelbly Action, Krieger gain-twist barrel, Shehane “Indian Blanket” Tracker 1000 laminated stock. CLICK HERE to see current price and more photos. Share the post "AccurateShooter Forum Registers 12,000th Member"
Our readers were very interested in the recent announcement that Remington Arms was selected to build the new M24E1 Sniper Weapon System, the successor to the venerable M24 Sniper Rifle used by the U.S. Army for many years. A key component of the M24E1 system is the new Leupold Mark 4 6.5-20x50mm Extended Range/Tactical (ER/T) M5 riflescope (34mm locking version). This scope features First Focal Plane (FFP) Horus ranging reticles (H27 or H58), side parallax adjustment, and a beefy 34mm maintube. Other key features of the new ER/T include M5 windage and elevation adjustment dials with audible, tactile 1/10 (0.1) milrad clicks to match the mil-based Horus reticles. An elevation zero-stop helps prevent under-rotation in high-stress situations. The eyepiece offers long eye relief and it employs a “lockable” fast-focus design to ensure that the reticle remains in sharp focus. The scope has an auto-locking elevation adjustment. With either a Horus H27 or H58 reticle in the front focal plane, the scope can accurately range at all magnification settings (the reticle magnifies with the image). The 34mm maintube allows for ample windage and elevation adjustment — a full 100 MOA of elevation and 100 MOA of windage adjustment. The Mark 4 6.5-20x50mm ER/T M5 Locking Adjustment riflescope is waterproof, fog proof and shock proof. With its M5 Locking Adjustment, the scope’s platform is unique in the Mark 4 ER/T line. It is controlled under International Traffic in Arms Regulations (ITAR) and limited to domestic and international government sales only. Share the post "New 34mm-tube Mark 4 Scope with Horus Reticle for M24E1"
In Switzerland, universal military training is required of young men, and after military service, Swiss men retain their military weapons, including assault rifles, in their homes. In addition, target shooting remains a hugely popular activity among the Swiss. Though it has a population of just 7,000,000, Switzerland boasts over 2,000 rifle ranges. Each year, close to 200,000 Swiss participate in the Eidgenössisches Feldschiessen (annual shooting skills exercise). A several hundred-year-old tradition, the Feldschiessen (aka Tiro Federale in Campagna) is the largest shooting event in the world. Shooting service rifles at 300m is typical at many Feldschiessen matches. Some Swiss ranges boast the latest high-tech equipment. At one of the popular ranges, 400 electronic targets served thousands of shooters. And get this — the Swiss government provides free ammunition at each year’s Feldschiessen. Contrast that with California — which recently passed legislation requiring citizens to provide thumbprints and personal data just to purchase ammo. Switzerland views armed citizens as a vital national asset. California views shooters as a pariah class that should be eliminated. Despite the popularity of shooting in Switzerland, and the nation’s tradition of maintaining an armed citizenry, there are groups seeking to restrict gun ownership and require that military arms be removed from homes and stored in military barracks. Both sides of the issue are covered in a video report from World Radio Switzerland. You should definitely watch the video. In it, Marc Heim, a Swiss citizen, explains that the Swiss government seeks to maintain “a very high state of readiness for the Swiss military and population. The [goal] has always been that, within 24 to 48 hours, Switzerland could mobilize a pretty large army.” Heim still has the Stgw 57 (7.5×55) rifle he trained with, as well as the rifles used by his father, and grandfather before him. Heim’s young son, in his 20s, keeps a modern, fully-automatic Sig 550. That is the rifle Marc Heim and his son would take to the Feldschiessen. Share the post "Swiss Shooting Traditions — A Nation of Riflemen"